It is difficult to overstate the importance of headlines. A good headline can entice and engage your audience to click, to read, and to share your content. In many cases headlines are the thing that is shared rather than the article. So you knew that. But do you know what makes an engaging headline? While there is no magic formula for creating a viral or popular headline, there are many lessons we can learn to improve our content engagement. We shared our findings with a number of content experts to reflect on the implications of the research for writers. We have included their expert thoughts and advice at the end of this post. We have also included a section on how you can analyze headlines yourself using BuzzSumo. Note: This research looks at the most shared headlines on Facebook and Twitter which tend to be dominated by major publishers and consumer content. Thus the insights will be particularly interesting for publishers. We are undertaking separate research on engaging headlines for business to business content which we will publish later this year. In our survey of 100m headlines published between 1st March 2017 and 10th May 2017, the three word phrases or trigrams that gained the most Facebook engagements (likes, shares, comments) were as follows. This phrase “will make you” gained more than twice the number of Facebook engagements as the second most popular headline trigram. This was a surprise. When we started out looking for top trigrams, this one wasn’t even on our list. So why does this particular trigram or three word phrase work so well? One of the interesting things is that it is a linking phrase. It doesn’t start or end a headline, rather it makes explicit the linkage between the content and the potential impact on the reader. This headline format sets out why the reader should care about the content. It also promises that the content will have a direct impact on the reader, often an emotional reaction. The headline is clear and to the point which makes it elegant and effective. 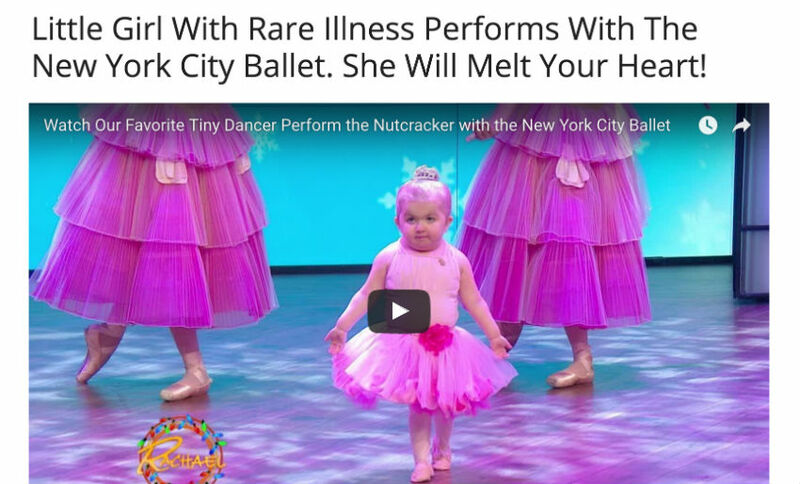 See the most shared “will make you” headlines from the last year. Many of the top performing posts with emotional headlines had image or video content although there were also story posts. Below is an example video post. Readers are often curious about what is being talked about by people, what the top items are in a league table, or what is being said by people on Twitter about a topic or event. This type of content appeals to a reader’s sense of curiosity and voyeurism. If you are curious, here are the most shared posts in the last year that have “are freaking out” in the headline. We would caution writers to avoid ‘what happened next’ style headlines. While they have previously performed well, Facebook now categorises headlines that withhold information as clickbait and demotes them. In my personal view this is a good thing and I hope we will see an end to such clickbait headlines. Here are the most shared ‘this is why’ headlines of the last year. Only 1 In 50 People Can Identify These 16 Grammar Mistakes. Can You? Quizzes remain an engaging format on Facebook. The first of these headline types is a quiz variation, it challenges you to answer to questions and to see if the quiz can then predict your age, level of education, job etc., based on your answers. These quizzes appeal to our desire to know more about ourselves and to prove we’re smart, we did grow up in the 80s, we are living in the right city, or whatever it might be. These quizzes are like mirrors, it’s hard to walk past with out looking at yourself. They are hard to ignore. Here are the most shared examples of ‘things only’ headlines in the last year. We have seen a significant growth in tribal headlines, particularly politically partisan headlines. It is almost as if there is a duty on the tribe to share posts that support their viewpoints. We saw this in the US elections and we have seen something similar in the recent UK elections. These tribal headlines tend to gain a lot of engagement and shares, which might be encouraging sites to use polemical headlines more frequently. 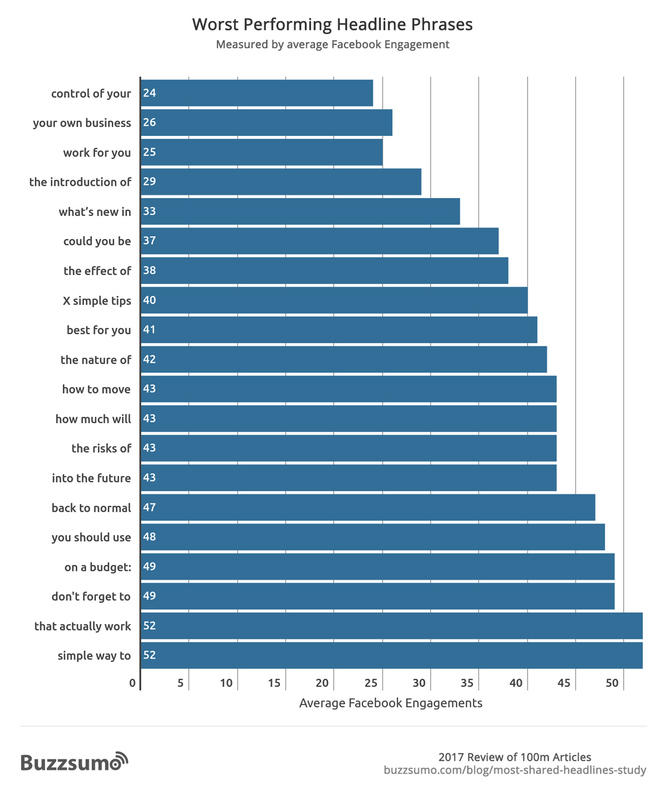 We thought it would also be interesting to examine the commonly used phrases in headlines that receive the lowest Facebook engagement. Note: We only looked at phrases or trigrams that were used on a minimum of 100 different domains. There will be worse performing phrases than those used above but these are the worst performing commonly used phrases. It was interesting to see how poorly phrases like ‘on a budget’ performed on Facebook. 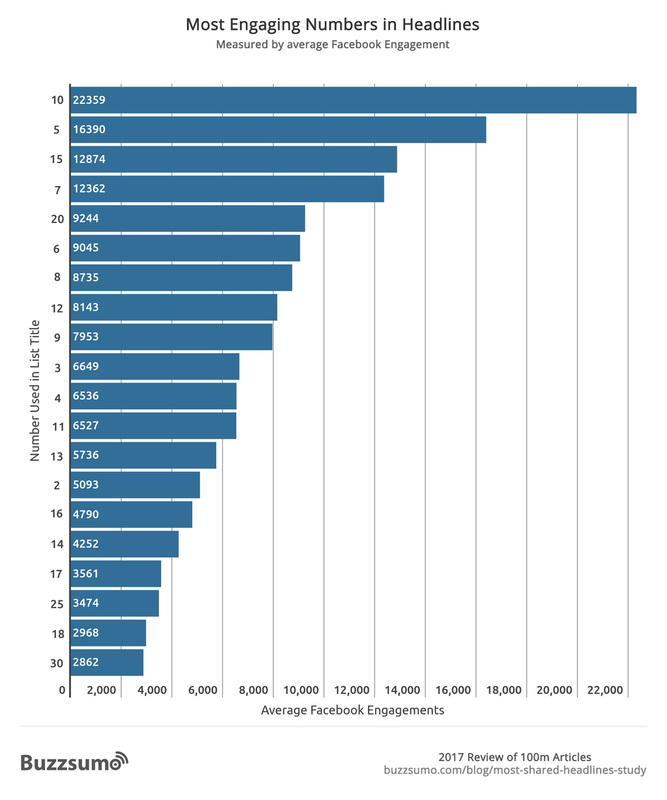 While some individual articles did well, the average Facebook engagement was very low. By contrast the phrase ‘on a budget’ appears to work really well on Pinterest for DIY topics. See the examples below. This highlights the importance of context. It may simply be that Facebook is not a place where someone is actively looking for tips to save money and that the Pinterest DIY context is better suited to this content. This reinforces the need to research what works for your audience, your topics and specific social networks. A headline may perform poorly on Facebook but work very well with a different audience on a different social network. The same is true when writing for different sectors, for example a phrase like ‘need to know’ may work well in say health but work less well in a different context. The key is to research what resonates with your specific audience and to test your headlines. The most popular phrase “will make you” is a phrase that clearly sits in the centre of a headline as it connects two elements. Thus it creates the structure by linking something to an emotional reaction. This was partly a surprise as previous research has suggested the most important part of a headline is the first three words and the last three words. It may be that using a linking phrase such as “will make you” actually emphasizes the importance of both the beginning and end of the sentence. We thought it would be useful to look at the top three word phrases that start headlines and the phrases that end headlines. 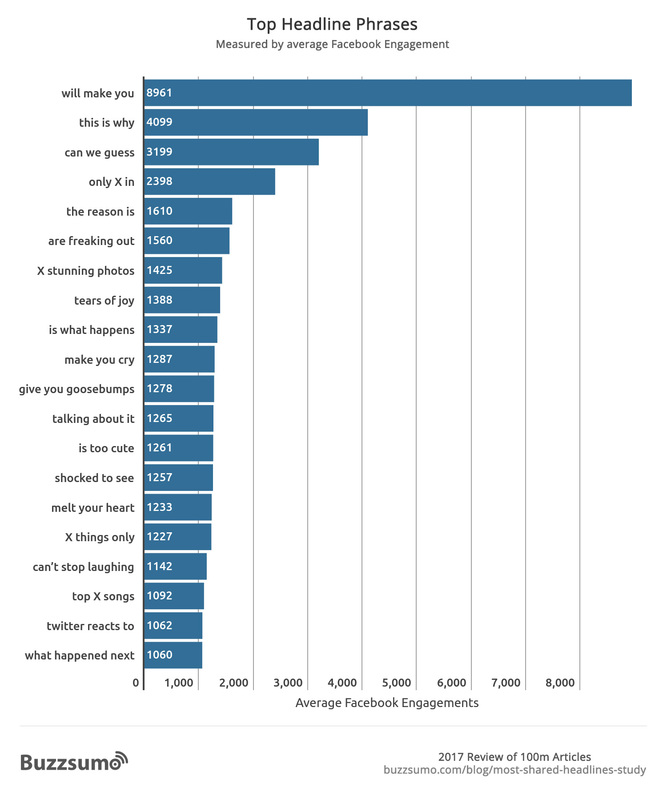 Below are the most popular phrases that start headlines by number of Facebook interactions (x represents a number). 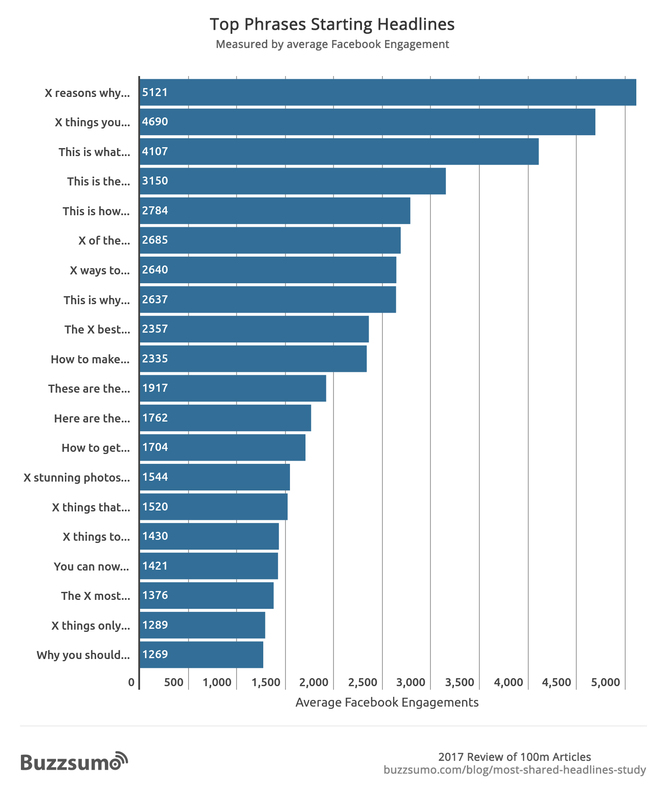 Below are the most popular phrases that end headlines by number of Facebook interactions (x represents a number). 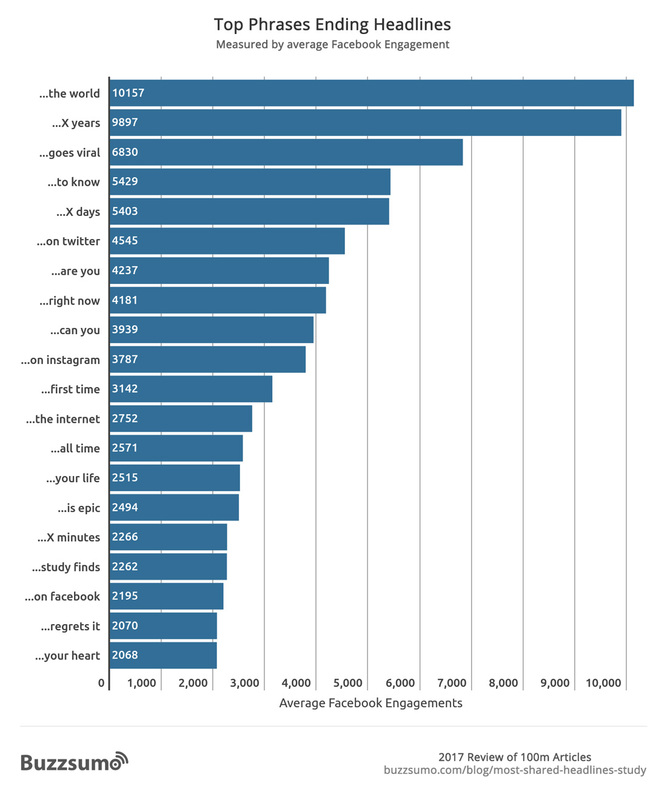 Finally, below are the most popular first words that start headlines by average Facebook interactions. Both of these align with the high engaging headline types we found when looking at three word phrases. The first is a form of voyeuristic content which provokes curiosity for example ‘High School Seniors Paint Their Parking Spots And Their Art Goes Viral On Twitter’. The second is a form of emotional content with often an explicit promise of exceptional content. For example ‘Clementinum In Prague Is The Most Beautiful Library In The World’. This particular example, was picked up and reused by Bored Panda with a similar headline ‘The World’s Most Beautiful Library Is In Prague, Czech Republic’. Both posts got over 250,000 Facebook engagements. Here are the most shared posts of the last year with ‘goes viral’ in the headline. Many of the most engaging phrases contain numbers, and many use a list post format i.e. headlines that start with a number. It is well known that list posts gain above average social shares. We were interested to see if there was any variation between the performance of different numbers, for example a list post starting with 10 or say 4. 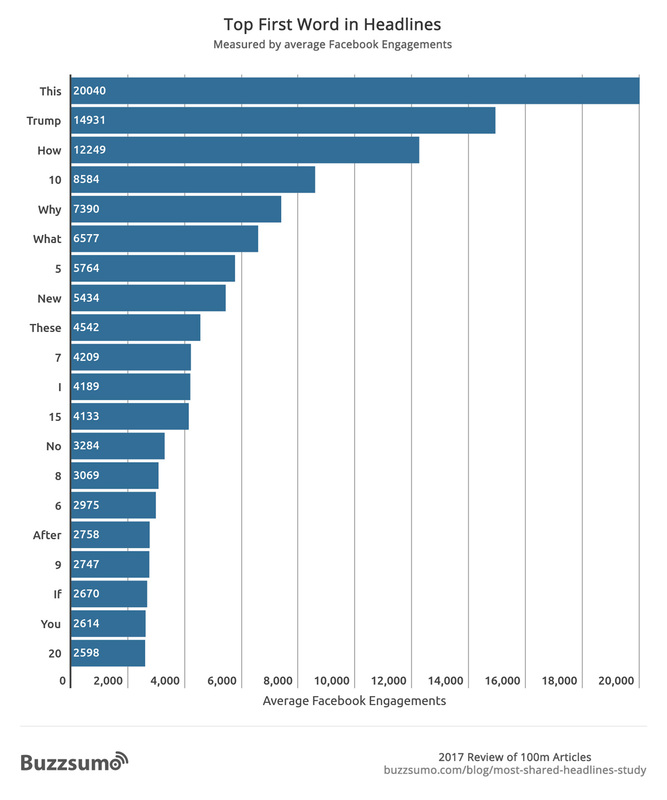 The table below shows the average Facebook engagements for different number list posts in our sample. We can see that the number 10 was the highest performing headline number, which confirms previous research in this area. Our research found that the next three best performing numbers in headlines were 5, 15 and 7. Many marketers have advocated using unique numbers or much longer numbers for comprehensive articles. Buzzfeed have had a lot of success with the number 23 for example, but on average 10, 5, 15 and 7 are the top performing list posts. Let’s look at the length of your headline. 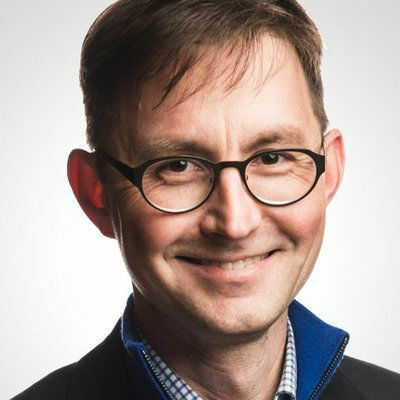 Experts such as Jacob Neilson have argued that the best headlines for news sites are very short. Jacob argues for as short as five words or less than 40 characters. Buffer’s Kevan Lee wrote a comprehensive post which suggested blog post headlines should ideally be six words or less than 50 characters. By contrast, research from Outbrain looking at 100,000 posts, suggests that 16 to 18 words and 80 to 110 characters is optimal for driving engagement. When it comes to email subject lines, research by MailChimp suggests that it doesn’t really matter how long subject lines are. We decided to test these assumptions. with our sample of 100m articles published between 1st March and 10 May 2017. 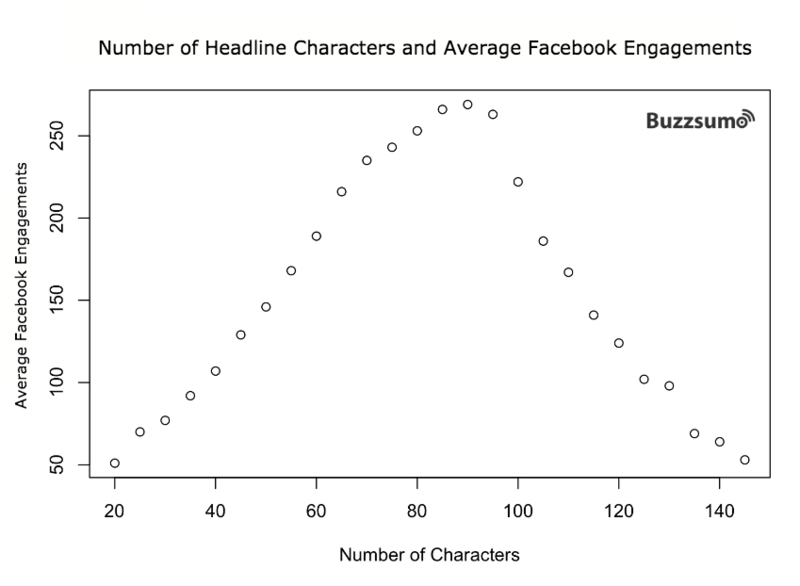 We analyzed the number of words in article headlines and plotted this number against the average number of Facebook engagements for all headlines in our sample. The results are shown on the chart below. We can see that posts with twelve to eighteen words in the headline receive the highest number of Facebook engagements on average. 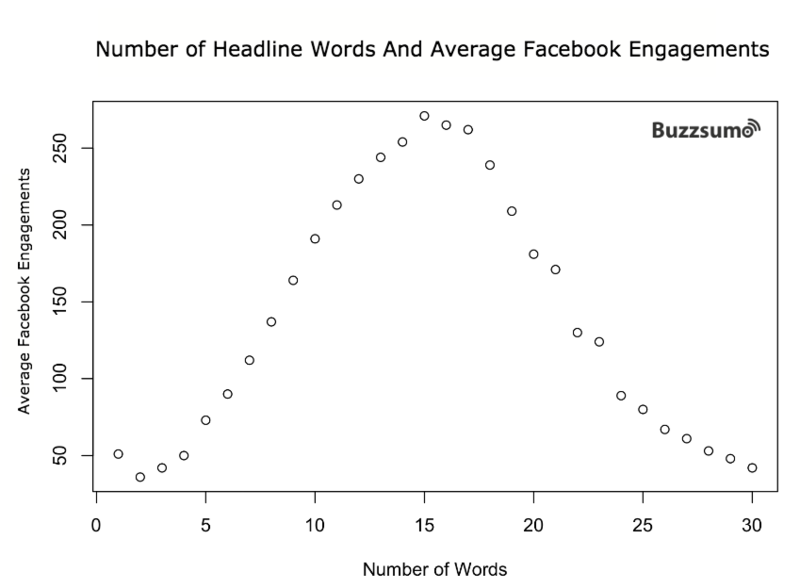 As headlines get longer or shorter the average number of Facebook engagements decline. Not surprisingly the number of characters has a similar relationship to average Facebook engagements as the number of words. In essence 80 to 95 characters appears optimal. Thus our research findings would tend to support Outbrain’s previous research that longer headlines work better when it comes to engagement. Will a headline that works on Facebook work equally well on Twitter? Not necessarily. We found the headline phrases that gained the most engagement on Twitter were quite distinct from those that gained high engagement on Facebook. The main exception was the powerful “will make you” phrase which was the top phrase on Facebook and also the fourth most shared phrase on Twitter. What is particularly interesting is the lack of emotional phrases in the top headlines that resonate on Twitter. This is very different to our findings for Facebook. 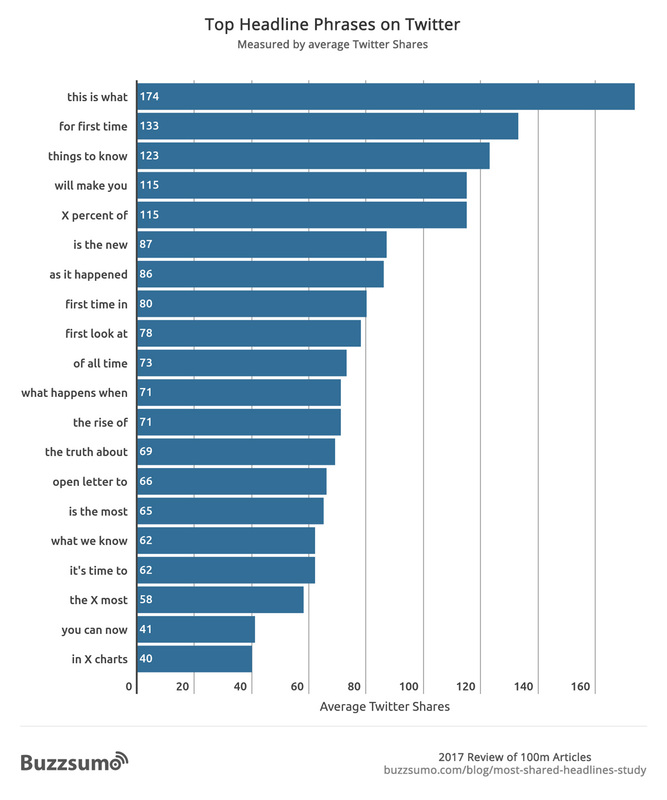 The top Twitter phrases have a focus on newness such as “for first time” and “is the new”. You can test the impact of different headlines on Twitter by trying different text in your tweets. Update: 18th July 2017. We have now completed our analysis of the best B2B headlines where we reviewed the 10 million most shared posts on LinkedIn in 2017. We found significant differences between the best headline phrases, structures, numbers and lengths for B2B headlines compared to B2C headlines. You can read the full analysis and post here: The best B2B headline phrases, words and formats based on 10 million posts shared on LinkedIn. 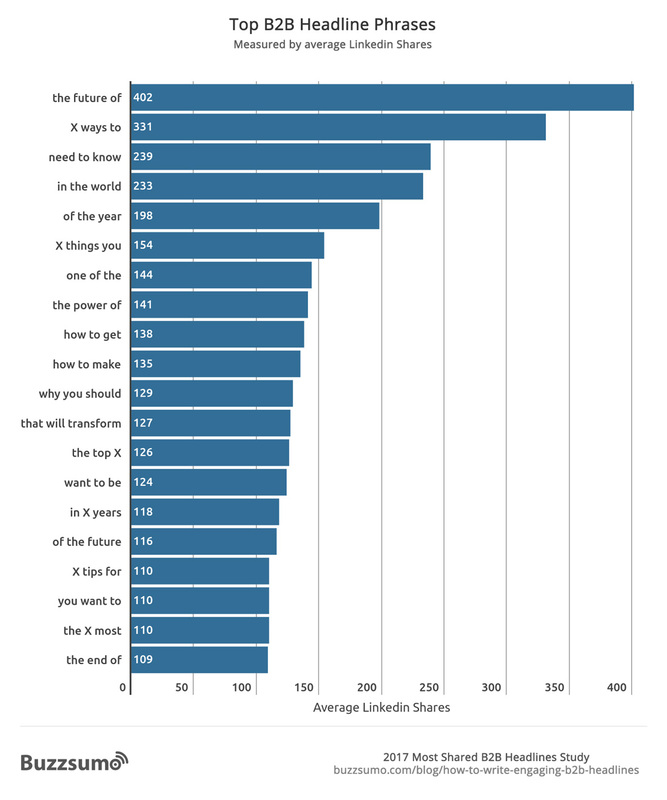 The top phrases in headlines shared on LinkedIn were as follows. We also found a significant difference between optimum headline lengths for B2B and B2C content. The optimum number of words in B2B headlines was much lower as we can see below. The red line is average LinkedIn shares and the blue line is average Facebook shares. The key point is that there is no simple formula or approach when it comes to popular headlines, you need to research and understand the headlines that resonate with your audience and industry. We shared our research with a number of content experts to get their thoughts, reflections and advice for content writers. Here is their take on the findings. “I’m sure that some marketers will take this research as prescriptive advice and cram every top trigram into a 15 word headline. “This is why these 10 stunning photos will make you cry tears of joy!” I’ll admit, I’d probably click that. But think for a minute about the cause behind the correlations. This research is telling us to give readers stronger reasons to click. Every time our readers see a headline, they do a split second cost-benefit calculation. It doesn’t matter if they’re in an inbox, a social stream or a search results page. The psychology is the same. Is this thing worth two seconds of my time? “There are three important things to note from the research. Headlines matter. Maybe that sounds obvious and most of us know this. But do we all spend as much time as we should on headlines? I suggest spending nearly as much time on the headline as on the article itself! Curiosity drives shares. Captain obvious here again. But the trick is to find a way to spark that curiosity in every headline. It’s why headlines that start with “Here’s why…” or “The one thing that will make you…” work really well. Because they spark instant curiosity. They make us feel compelled to read. The research also reinforces the importance of context and of understanding what works in your specific context, such as your audience, your industry, your topics and your social networks. Why should the reader care about your content? Can you make a promise or claim about the impact of your article on the reader? Can you include an emotional element – especially if looking to gain traction on Facebook? Are you tapping into a trending topic, if so can you call it out in the headline? Can you make it a quiz or challenge? Could you position it as an explanation or answer post? Who’s your tribe – what headlines resonate with them? Will a more partisan or controversial headline appeal to your tribe? Are you aiming for 12-18 words in your headline? How Did We Decide On The Headline For This Post? Thus after much deliberation and discussion we decided on using this format for the post headline. We looked at the headlines of 100m articles published from March 1st, 2017 to May 10, 2017 and analysed those that gained the most social shares. We specifically looked at top trigrams (three word phrases) used in headlines. We started by ignoring trigrams that were topics such as “Game of Thrones”. We were conscious that popular sites can skew the results, therefore for this analysis we only included one headline trigram example per domain. For instance, “can we guess” is a very popular BuzzFeed trigram thus we would only have included one “can we guess” headline from BuzzFeed in our trigram analysis. From the subsequent list we then removed the three most shared examples of each trigram to remove potential outliers, such as a post that got say 100,000 shares. For our analysis of the optimum number of words and characters in headlines we included all 100m posts. If you want to do some analysis of headline phrases yourself, you can simply put a phrase in double quotes into BuzzSumo such as “can we guess”. The search will return the most shared articles with that phrase in the headline and display the share counts from each network and the number of linking domains. Here is an example of the most shared posts for “the future of“. You can further refine your search by adding additional words after the phrase in quotes, here is an example: “the future of” Elon Musk. This will return the most shared headlines with the phrase “the future of” and Elon Musk. You can do this for multiple phrases or phrases and topics. You may also be interested in our previous post on how to create viral headlines. I can’t bear ‘clickbait’ because when I click it I hate knowing that I’ve been manipulated, but there’s some solid gold advice here for those of us with less cynical motives too. Me too. I dislike the ‘what happened next’ style headlines in particular. Thank, I hope it is helpful. That one really surprised me as well but when I sat back and reflected it made more sense. I think it is connecting the content to the impact on the reader. Also giving you a clear reason to read. LOL I like how you yourself used it in your section heading “Why The Data Will Make You Think Again About Headlines” ….very subtle. I’m surprised no one else picked up on it…Great article with a lot of actionable information. Excellent article that I’ll take some time to digest Steve. That number 10 is really quite remarkable, but of course, the research backs it up. This is a great follow-up to your Top B2B Content Formats article. There’s so much to digest here. Thanks for sharing all your findings and for enriching them by getting feedback on your insights from some of the top communications influencers. Hi Diane, thanks. Yes, I think getting expert views is something we should do more often. I love all the research that goes into posts like these. I appreciate that when I’m reading a BuzzSumo blog post I know I’m going to get a deep dive into a topic, with actionable insights I can put to work in my own writing immediately. Thanks for this great resource! Thanks, Kate. They take a while to research and produce but hopefully they provide some helpful insights. I really love your studies, guys. With this one, while it’s super-useful, did you look into the site’s popularity factor as well? A bad title on a big site would have better numbers than a good title on a small site, so correlating the findings with available data per site aggregated across all sites (so basically adding the popularity index into the calculations) might give some more accurate results. Thanks, it is a really good question. We were conscious of the potential skew of larger sites if they used particular headlines frequently (as they tend to). Thus for trigrams we only included one instance per site of a particular trigram. We also removed the three most shared posts for each trigram to remove potential outliers eg a post from a Buzzfeed that got say 100,000 shares. It isn’t perfect but it lowers the potential of very large sites to skew the data. Thanks for sharing, it’s a pretty good approach. Thanks for this great piece of content! 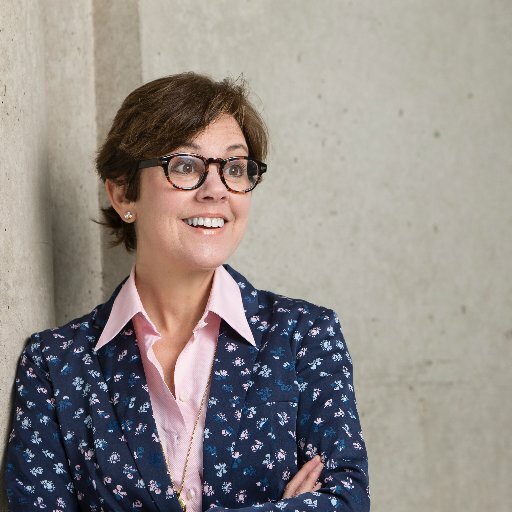 Definitely a must read by anyone in content marketing. By the way, what software have you used to create the bar charts? Look good. Hi Dustin, thanks. Absolutely agree. The principles may apply but the key is to research what works for your topic, audience and industry. Very insightful article. I’d like to ask though if you were also able to get the demographics of those who engaged on those given headlines? I’m only wondering if these data would be applicable to the Philippine market. We can see who shared posts on Twitter and look at their location but most shares are on Facebook. One thing you can do is use the top level domain filter in BuzzSumo to search for the most shared posts on a topic only from .ph domains. You can also search in any language. Hi, you can search for top headlines on BuzzSumo for .ph domains and by language. My suspicion is the underlying principles probably apply across markets eg be clear why the reader should pay attention to your content, provoke curiosity, use emotional hooks, have a clear promise in the headline etc. Hi, we didn’t look specifically at demographics. However, you can look at headlines resonating by top level domain such as .ph and by language on BuzzSumo. Thanks for this post. I’m working on refreshing our social processes at our agency and this is really useful. Cheers! 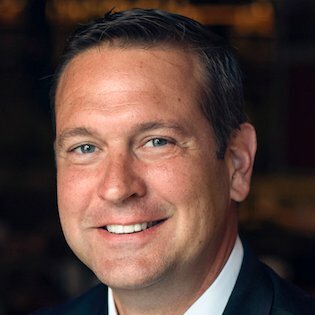 A must-read analysis for every marketer, congratulations, Steve! A question to your methodology at calculating engagements: how did you weight the frequency of the three components: likes, shares, comments? Or 1 like = 1 share = 1 comment? Kornel, that is a good question and one we discussed a lot. Shares are arguably much stronger than likes, although likes can also cause content to be shared in a Facebook feed. Comments potentially indicate a higher level of engagement. We decided in the end to simply use total Facebook engagements, so the number includes all three components, effectively they are equally weighted. I agree that even if they are not equivalent, it wouldn’t be easy to find other correct ratio. Hi, thanks for this really useful analysis – I’ve pulled some handy conclusions from it. I have a question though regarding the section on number of items in a list. From your data, 10 item lists gain the most engagement then 5, 15, 7 then 20, etc., but how many lists exist in your dataset with each of these numbers? As in, if the majority of website post 10 item lists, it’s inevitable that 10 item lists would come out on top with the most engagement, because there are just more lists of that number out there. Hi Charlotte, good question though just because there are more uses of a number it doesnt mean they will have higher average engagement. In our sample there were 2,675 10 list posts but it wasnt the most used. For example, there were 4,363 25 list posts and 3,367 3 list posts. Would love to see this analysis for LinkedIn posts! We are working on it but in the interim you can just enter linkedin.com into BuzzSumo search to see most shared posts on LinkedIn. You can also add a word after the domain to see top articles for topics on LinkedIn or put a phrase in quotes eg “future of” to see all the top headlines with that phrase on LinkedIn eg linkedin.com “future of”. See https://app.buzzsumo.com/research/most-shared?num_days=365&result_type=total&q=linkedin.com%20%22future%20of%22&general_article&infographic&interview&video&guest_post&giveaway&page=1&type=articles If you are a paying customer you can also export data each eg top posts for each month and then combine into larger data set. Love this. Just wish the article was titled “We Analyzed 100 Million Headlines. What We Learned (New Research) Will Make You Less Vulnerable To Manipulative Headlines.” Idk, maybe that’s to meta. 🙂 We did think about it. I worked in social media for 3 years and ”research” like this always makes me laugh. Kudos, Steve. Very well done! Thanks, really appreciate the feedback, I hope it is helpful. Great read, I just skimmed over it so I’m going to come back to absorb more info when I have more brain capacity. Thanks Sam, yes, there is a lot here. We had so much data the hard part was trying to decide what to include but felt I should stop at 4,000 words! We will be publishing a separate post on B2B headlines as there appear to be some important differences. Thanks for the great research and reporting. Subheads helped me to get my mind around the indepth material presented. I also appreciated inclusion of expert reflections. Many great ideas that will make my headline writing easier and better. Maybe ask all of us for results feedback in a few months? Thanks, I think the key takeaways are about the importance of context and the underpinning principles of what makes a headline engaging. It is not copying a phrase or using power words but making it clear why the reader should care, provoking curiosity, having emotional hooks, appealing to a tribe or providing clear explanations. These broad principles I think are more valuable lessons than identifying popular words or phrases. I agree, Steve. Great “takeaway summary.” The examples of popular words and phrases helped to anchor the ideas for me yesterday as I wrote headlines. The list by one of your experts (don’t remember the name) of “what to think about when you write headlines” also helps to go deeper beyond just lifting sample phrases. I always love to learn what I can apply immediately … this is a five stars in that category. A fascinating study with a huge amount of valuable insights that I can use immediately. Had to take notes but will return to this as an important resource. Many thanks for this extensive research..
Hi Steve, great article and very cool that you reply to questions here. My question is, can we look at the headlines that work best by Age or Region? We target the mature market and I would love to know how people age 55+ or 65+ compare. Hi Jake, thanks. We didn’t look at specific regions or demographics. They would be interesting to research. I suspect some of the core principles will apply consistently such as making it clear why the reader should care about your content, provoking curiosity etc. However, the words, phrases and formats to do this could be quite different for different audiences. You could pull data from specific domains which you know have an older readership and those which research shows have a younger audience and do some comparisons. You can also test headlines using FB ads targeted at different age groups. Would be an interesting area to explore further. 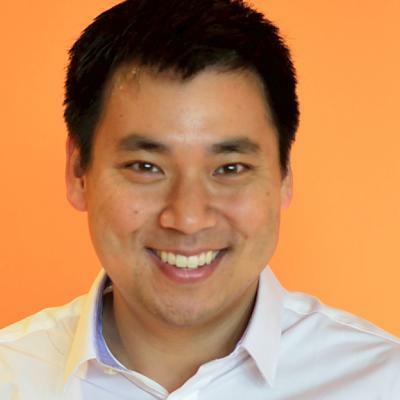 Re what Larry Kim said about slapping a careless headline on carefully crafted content – beware, folks, the reverse is true and nothing kills a reputation quicker than a catchy headline that leads to an insipid list or article. As a LinkIn reader, I can say that 90% of their content reads like it was machine generated. Just saying. I read it sometimes because it’s short enough, but it’s useful only as a substitute for Spider Solitaire – not as something to engage with. Hi Judy, I agree with that. A headline is one thing but you have to deliver on the promise, otherwise you might get a click but you won’t build a reputation and authority. This isn’t about honestly useful information-sharing. This is how Facebook clickbait works. If the clickbait approach to information is what’s recommended, we are ethically doomed. Thanks, be interested in how you get on. Thanks, really pleased if it is helpful. Clearly headlines have always been important. But just seeing the data as you have shared should hammer that home even more. Will have to spend more time digging into them now that the bar has been raised in terms of insight. Thanks Paul. It is a really good point about regional differences. The US would not use Brilliant as we might here in the UK. Even on this headline ‘analyzed’ is a difficult one because of different spellings and I considered dropping it. Definitely scope for a study looking at regional variations. Thanks Andy, yes, I was surprised. Our latest B2B research shows that shorter headlines gain more engagement in a business environment. I will file this, so much great stuff! What a great post! So timely as I have just invested an hour with a new writer explaining the impact of logic vs emotion and how if the reader doesn’t buy into the heading, everything else is pointless. Thank you! I just gained so much insight from your post. ALOT of work! went into this. This is so valuable to me. I have been researching and reading everything I can as this is all so very new to me. Thank you so much for this incredible share! Great article! Very useful and timely information. I’ll be sharing and referring back to this piece often. Thank you! 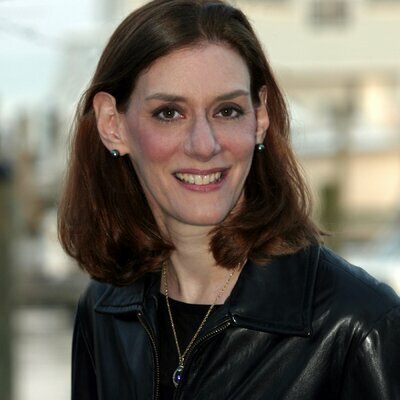 If you liked these data-driven results, you may also like Lon Safko’s newest book, “7.5 Secrets for a Successful Blog,” based on an analysis of Dave Kerpen amazing blogging success. Marvelous, marvelous article. Thanks for sharing this data! Earlier this week I read an article from CNBC titled Millennials only have a 5-second attention span for ads, says comScore CEO. This just confirms my belief that most people, and not only Millennials, will not invest their time unless the headline really grabs their attention. In this regard, your article is on the money! Great article. I have always wondered if “click bait” post headlines hurt a brand? I agree with ragtime cyclist and Steve in feeling “duped” by a headline. Thanks, my instinct is they do hurt a brand. Excellent research. Thanks for sharing it with your readers. Periodically I link to relevant articles from trusted sources on our company Facebook page. I wanted to try out using one of the top headline phrases, but our IT team says we can’t because FB is phasing out the ability to edit headline text. I have to use the “given name” of the article. I assume this is to cut down on all the fake news. Correct? Sometimes the headlines can be even more interesting than the content they belong to. It’s so fascinating but I have to write n essay. I hope that this research and the article that I found about solving writing problems will help me to do this. This is such an amazing post. The insights given here are so helpful and i hope it will help to shape ours. Thanks for all the time that you put in .Very impressed ! Hi Steve, Thank you for conducting this thoroughly detailed research. I was probably as shocked as you were to discover that “will make you” is the most popular headline phrase in terms of average Facebook shares. How do these terms translate in organic search? It’s well-known that “how to”, list posts and case studies work best in terms of acquiring links and receiving shares on social media. For organic search, things are different too because people are actually searching for terms like “how to start an online business” as opposed to the interruption marketing methods on social media channels like Facebook. 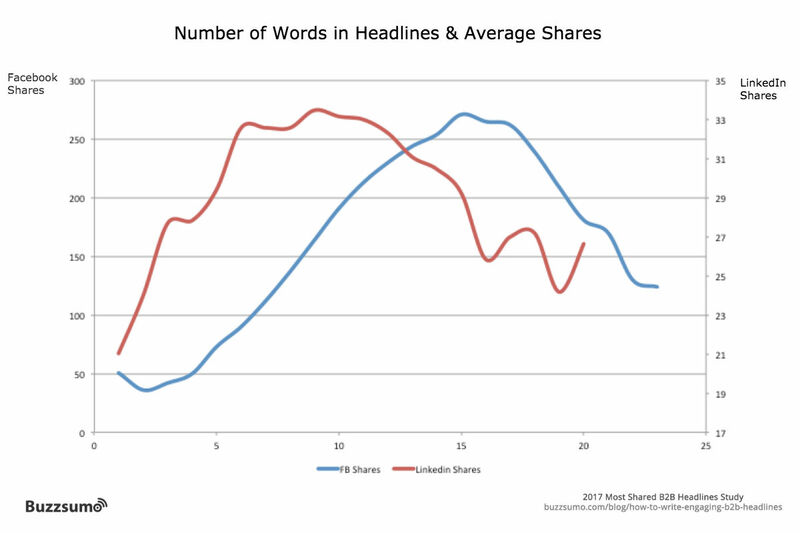 Very interesting insights and research on how to grab more attention with your headlines. Thanks!